If you're searching for a casual yet totally stylish outfit, pair a Palmer Harding ruffle sleeve blouse with gold sequin skinny pants. Both items are totally comfy and will look fabulous together. 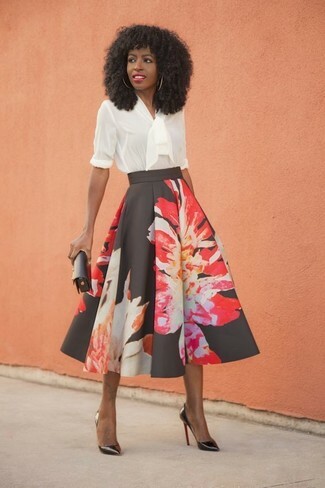 When it comes to footwear, this look is round off wonderfully with red suede pumps. If you're searching for a casual yet stylish look, opt for a Palmer Harding ruffle sleeve blouse from Nordstrom and a black floral full skirt. Both garments are totally comfy and will look fabulous together. And if you want to instantly up the style ante of your look with one piece, enter black leather pumps into the equation. 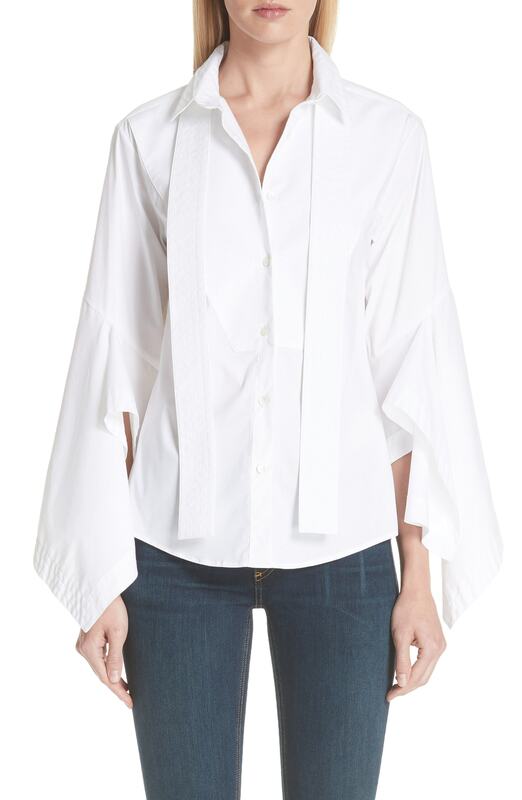 If you're searching for a casual yet absolutely chic ensemble, consider pairing a Palmer Harding ruffle sleeve blouse with blue jeans. Both garments are totally comfy and will look fabulous paired together. You could perhaps get a little creative when it comes to footwear and spruce up your outfit with olive leather tassel loafers. 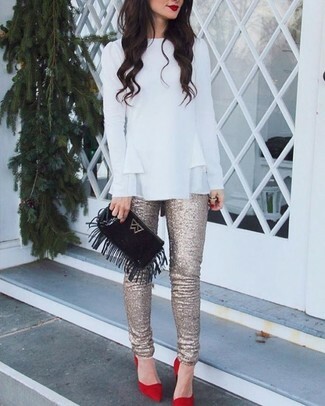 This pairing of a white ruffle long sleeve blouse and black tapered pants combines comfort and functionality and allows you to keep it clean yet trendy. Black leather ankle boots are an easy idea here. This combo of a Palmer Harding ruffle sleeve blouse and a burgundy tweed mini skirt is simple, chic and oh-so-easy to copy! Opt for a pair of black suede over the knee boots to kick things up to the next level. For a knockout-meets-stylish look, try pairing a white ruffle long sleeve blouse with a pink pencil skirt — these two items go brilliantly together. If you're on a mission for a casual yet totally stylish getup, wear a white ruffle long sleeve blouse with a multi colored vertical striped maxi skirt. Both pieces are totally comfy and will look fabulous paired together. Rocking a pair of black leather pumps is a simple way to add extra flair to your getup. If you're scouting for a casual yet totally stylish ensemble, opt for a Palmer Harding ruffle sleeve blouse and black ripped skinny jeans. Both pieces are totally comfy and will look fabulous together. You could perhaps get a little creative when it comes to footwear and lift up your outfit with navy suede ankle boots. This combination of a white ruffle long sleeve blouse and a blue denim mini skirt is super easy to imitate and so comfortable to wear as well! When it comes to shoes, this getup is round off wonderfully with tan leather wedge sandals.